On Thursday, May 24, 2018 the Lake Forest Park City Council, by a three to two quorum vote, passed updated Conservation Cluster Housing Ordinance 1174 with one additional technical amendment. It all created more concerns for residents that LFP now has a “band-aid” type ordinance for a significant housing change. While all Councilmembers agree that Ordinance 1174 is not a perfect solution, not all agreed that it should pass. 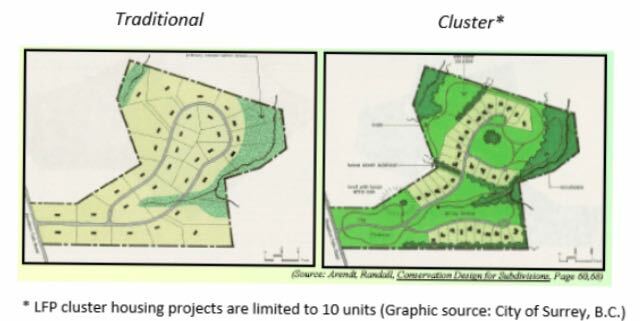 The ordinance now allows any residential property in LFP with over one acre or more in lot size to build Conservation Cluster Housing (CCH). LFP residents have spoken quite loudly that this type of housing, which encourages more population density, is a concern in a City that already struggles with the ability to provide the essential services to its residents due to a lack of commercial tax base. However, stronger density is needed in LFP to support a commercial base, so the coyote is always chasing its tail. Also, when LFP streets were first platted, they followed the natural curve of the land and with many blind and narrow turns and lack of sidewalks, adding density without safety features in place is not seen as a prudent thing to do. Residents are already experiencing almost grid-locked arterial streets at rush hour. Many wonder how the roads can accommodate higher capacity, and where will more cars park as the CCH ordinance only requires one parking spot per unit? Councilmember Semra Riddle noted that those citizen concerns are all being well-addressed in the City’s Safe Street-Safe Highway initiatives. There is no budget approval yet for this costly undertaking, so some residents are wondering – will Sound Transit 3 help bring the necessary funds for such plans? No one has those answers as of yet, and residents have not seen a commitment that ensures safer streets and highway at this point. Councilmembers Kassover, Resha, and Riddle were the three 'yes' votes that passed Ordinance 1174. Councilmember Kassover expressed concerns about the increase the City sees in short plat permit applications with larger square footage homes being built that look out of character for LFP. “Short Plat” is LFP’s current short subdivision of land into four or fewer property lots. She believes that conservation cluster housing is a better option than the current short plat home building choice. With CCH she believes LFP can better protect the tree canopy, provide for a range of diversity / affordability of housing, and retain more of the LFP character. For instance, in CCH, the setback requirement for building is 15 feet. In the City’s short plat ordinance, the setback requirement is only 5 feet. Residents also wonder why the City can’t then update the short plat ordinance to incorporate greater setbacks and restrictions instead of offering another housing choice? Some cities restrict the size of homes that can be built on a single family lot to help maintain neighborhood character. 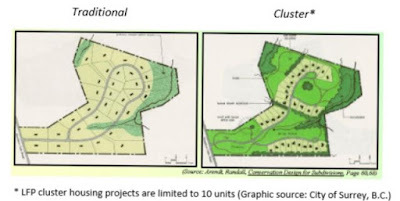 Other residents, as well as Councilmember John Wright, feel that the current tree canopy and critical tree ordinance updates address previous short plat development and environmental destruction issues. The CCH Ordinance could be a redundant effort for City Staff already burdened with a heavy workload. Ordinance 1174 is “not a perfect solution,” stated Councilmember John Resha, and it would not impact current single-family zoning laws, even with duplex units included. Residents have expressed concerns that if zoning changes, property tax assessments for similar properties in that neighborhood or area could be assessed at higher rates due to new development potential. It’s an idea with “good intentions but needs a more thorough approach,” said Councilmember Mark Phillips, who voted against the passage of Ordinance 1174. He has repeatedly questioned how CCH helps current LFP seniors who want to downsize and remain in the community they know and love. Many seniors show preference to move to a single floor home without stairs to age in place. Councilmember Riddle said that CCH is not only for seniors who are “infirmed.” Stairs are not an issue to active seniors, she believes, and that CCH is more desirable to those whose primary concerns are with the continuation of maintaining a more extensive property. One resident stated, after sitting through the Council Meeting on May 24th, that CCH, in theory, sounds like a great idea, but it does raise a lot of questions that have not been answered. Other dedicated residents gathered solemnly after the vote passed to discuss whether a lawsuit by the residents is feasible. Councilmember John Wright stated that he does agree that CCH will not negatively affect property values. He believes LFP will always be an expensive place to live due to its proximity to Seattle, the fastest growing City in America, and that there is no such thing as affordable housing in LFP anymore. But Councilmember Wright went on to say that he is mainly concerned about the voices of the “people who do live here and not the people who don’t live here.” He said he understands the meaning of a transparent process. For many residents in LFP, this appeared to be an opaque process rather than a transparent one. Councilmember and Vice-Chair Tom French oversaw this meeting in the absence of Deputy Mayor Catherine Stanford so he did not have the ability to vote on this ordinance. Councilmember French has stated in previous recent meetings that he felt the topic of CCH “warrants a robust resident discussion,” and that he can clearly see the need to gather the right data to make informed decisions going forward. He said it would be “good for us all of to take a big breath and start over in 2019” regarding this topic. Mayor Jeff Johnson was absent from the May 24th meeting. Donna Hawkey is an 21-year resident of Lake Forest Park and can be reached at dhawkey@comcast.net.